Let’s climb to the top of Mount Catherine! This tour can be combined with a visit to Moses’ Mountain, too. 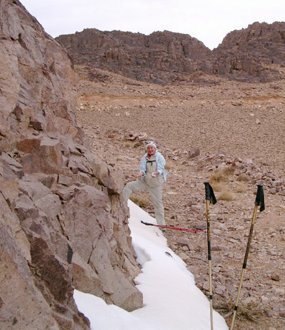 With an altitude of 2637 meters Mount Catherine or Dschabal Katrina is not only the Sinai’s but also Egypt’s highest mountain. This climb requires a better physical fitness than the ascent to Moses’ Mountain. For this trip we are leaving for Saint Catherine in the late afternoon. From here we will begin the one hour walking tour to Wadi Arbain, the starting point of the climb to the summit of Mount Catherine. We will be spending the night in one of the simple homes of the Bedouins. The ascent is partly very steep, leading us past a terrific mountainside. 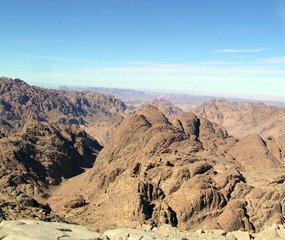 After approximately 2 hours we will arrive at a high plateau where we can already enjoy the overwhelming view over the Sinai’s highlands. It will take us another two hours from there to reach the summit at 2673 meters. 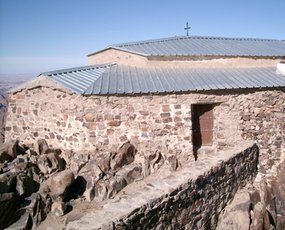 At the top of Mount Catherine we will find a little chapel, just like an eagle’s nest. 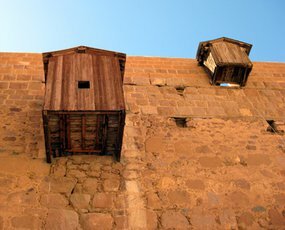 You can see beyond the highlands of the Sinai and even spot the summit of Moses’ Mountain. We will be enjoying a glass of wine while watching the amazing sunset. Our descent will again lead us through the Wadi Arbain back to Saint Catherine. If you take a closer look the barren landscape will reveal a lot more life than you’d have expected and offers lots of wonderful natural experiences.